Healthcare-associated infections (HAIs) are the bane of any facility manager’s existence, and for good reason: Roughly one out of every 20 patients who are already being hospitalized for a medical condition will contract another illness due to contact with one, according to the CDC. Looking at the problem from a national perspective, HAIs add an estimated $30 billion to American health care costs every year. With Medicare level reimbursements leveling off (if not dropping), facility budget-cutting and hospitals looking to avoid penalties from the Centers for Medicare & Medicaid Services for not cutting down HAIs and subsequent admissions, facility managers are always on the lookout for new ways to stop the spread of dangerous bacteria. The tide may be turning, thanks to more diligent cleaning techniques and use of infection–killing technology. The incidence of Clostridium difficile bacteria contaminating hospital rooms can be reduced significantly with the help of new technology, according to a recent study appearing in Infection Control and Hospital Epidemiology. Evaluating the thoroughness of cleaning efforts with the help of fluorescent markers. 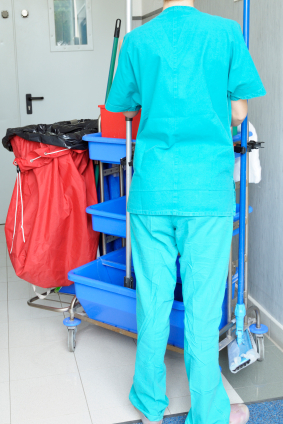 Using an automated ultraviolet radiation device to disinfect rooms and improve cleaning. Toughening existing disinfection standards that included daily work by a dedicated disinfection team monitored by supervisory staff. Some of the high-tech improvements in promoting environmental hygiene are impressive. One such system developed by Ecolab, the DAZO fluorescent marking gel and black light key fob, confirms the cleanliness of high-touch surfaces minus the need to do a culture in real time, with the help of an iPod Touch device. Hydrogen peroxide vapor room and UV light decontaminating systems, similar to the one used in the Cleveland study, can also be used in intensive care units, isolation rooms, operating rooms after routine cleaning has been performed. Some experts believe these systems are too cost-prohibitive to be considered for use in hospitals. To the positive, however, the projected health problems that may be sidestepped due to bacteria — and the savings that come with them — could be more than enough to justify their cost. For more information on reducing HAIs at your health care facility, contact Vanguard Resources.